After looking at a few recipes, this was the one I wanted to try. I love Nigella, I think she showcases food in such a beautiful way, and it should be treated that way. Having a beautiful meal is joyful, watching your family eat your food and enjoy it, where it gives them pleasure is a home cooks dream. I am blessed to have a family that loves to try new things, loves spicy, loves sweet, loves variety. Now I had no real idea how this was going to turn out, but I thought, she has gone onto Masterchef with this one to showcase it, surely it is good. Well it was better than good, it was a flavour explosion in your mouth. Every bite was amazing, it was fresh, it had sourness from the vinegar in the salad and the yoghurt on the side, it had spice from the Chilli, Ginger and Garlic Sauce, it had bursts of fresh coriander. Honestly it was so tasty, I can't wait to have it again. And after you finish your meal, the flavour lingers in your mouth, and it's nice. Now you can watch Nigella make this dish here tenplay.com.au/channel-ten/masterchef/recipes/tequila-and-lime-chicken-with-chilli-ginger-garlic-sauce-and-baked-potato and in the clip after the chicken is removed she adds water to the baking dish to create a sauce. Now as I doubled the recipe, I found I had a lot of liquid in my baking dish, so with 10 minutes left in my baking, I poured the pan juices into a frying pan and reduced it that way, to create a sauce. You skim away excess oil while it is reducing, you don't need it. And this sauce is unbelievably delicious. So don't fret if you to have too much liquid, this method will give you an amazingly flavourful sauce. You can use a whole chicken, or just chicken thighs (whole thighs or thigh cutlets, skin on), that is completely up to you. The chilli, ginger and garlic sauce isn't really a sauce, it is just these three ingredients blitzed up. But it is essential and it is spicy. If you find after blitzing it, it looks a bit dry, add a little more lime juice (and sugar) if needed. Some limes have more juice than others, so just play with the flavours until you are happy. With the green salad, here I liked to use iceberg lettuce as it is super crunchy. Just dress it with White Wine Vinegar, Extra Virgin Olive oil and season with salt, do everything to taste. It is important that the chicken pieces sit in the baking dish/tray without a lot of room to spare, or else the marinade will immediately evaporate in the hot oven, so chose an appropriate sized dish. So if you are looking for a fresh, tasty, chicken dish, look no further, this is truly on the loveliest chicken dishes I have made. Place the tequila, zest and juice of the limes, the chilli flakes, salt and olive oil in a large freezer bag. Add the chicken thighs. Seal or twist the bag tightly (letting out the air first) and give the chicken in the bag a good toss about to mix all the ingredients together. Place it in a baking dish and place into the refrigerator for at least 6 hours or overnight. I like to turn the bag over every now and then for even marinating. Remove the chicken from the fridge at least 30 minutes before baking. Remove the chicken thighs from the bag, reserving the marinade. Sit the chicken pieces on a smallish, shallow baking tray and allow them to come to room temperature. You want the pieces close together, to eliminate too much evaporation of the marinade. Just before placing the chicken in the oven, pour half of the marinade over the chicken pieces and transfer to the oven for 25 minutes. 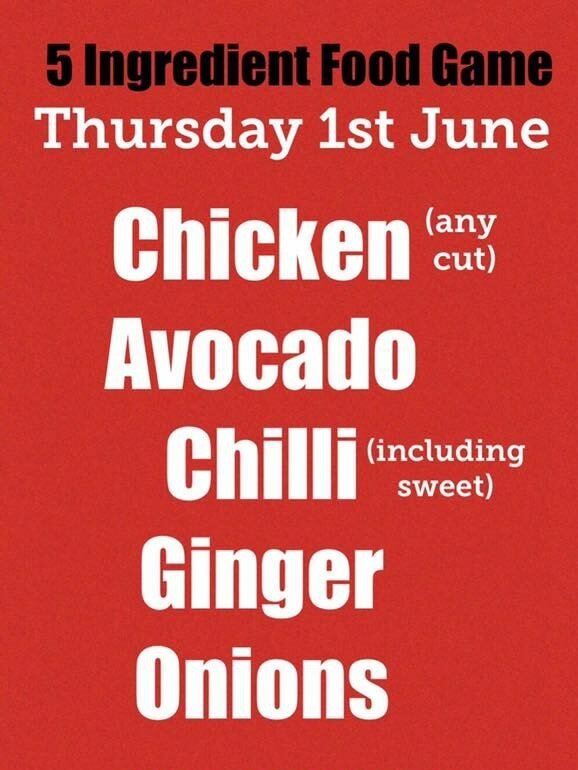 Make the Chilli, Ginger and Garlic Sauce: Place all the ingredients in a food processor or blender and blitz. If the sauce looks too thick, add a bit more lime juice, then adjust sugar, if needed. After 25 minutes of baking, take the chicken out of the oven and pour over the other half of the reserved marinade, then put the chicken back in the oven for another 25-30 minutes. Make the Yoghurt Dressing: In a bowl add the yoghurt and coriander, season with a little salt and stir to combine. When the chicken is cooked through, remove from the oven. Put the chicken pieces on a serving plate. Then add a little boiling water to the pan to help get every last bit of flavour sticking juice out, and pour it over the chicken. (If you have a lot of pan juices don't add the water, read my notes above as to how to make the sauce). 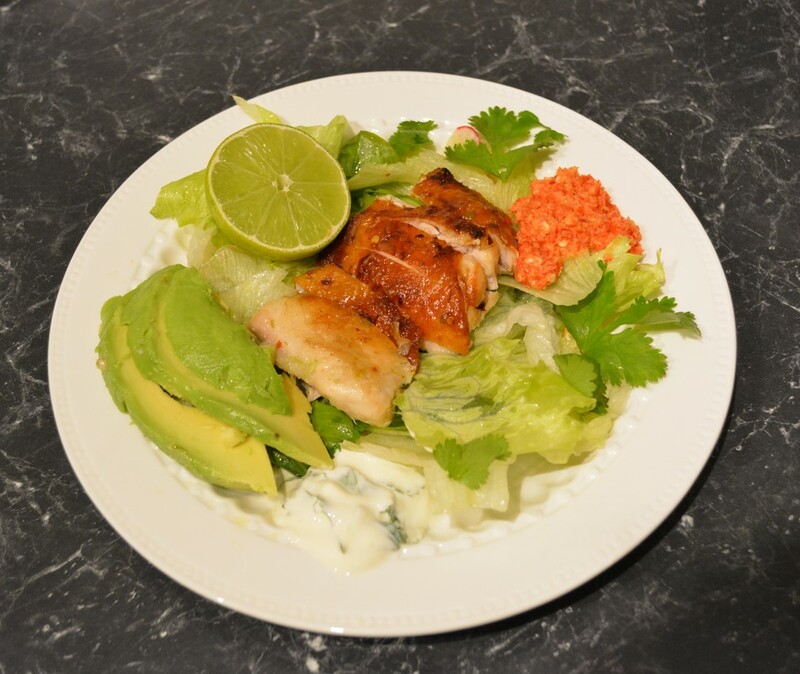 Serve the chicken with a green salad, some more coriander, some sliced or mashed avocado, some sliced shallots, the yoghurt dressing and the chilli, ginger and garlic sauce. Don't forget the wedge of lime.